Here are some useful web sites that I have ran across over the last couple of years. Perhaps you will find some of these useful as well. ORC PUB version 2. Here you will find an excellent set of tools. These include a Character Builder, Race Builder, Background Builder, Spells, Monsters, Items, Combat Tracker, Encounter Builder, Monster Builder, Spell Builder, Feat Builder, Class Builder and more. 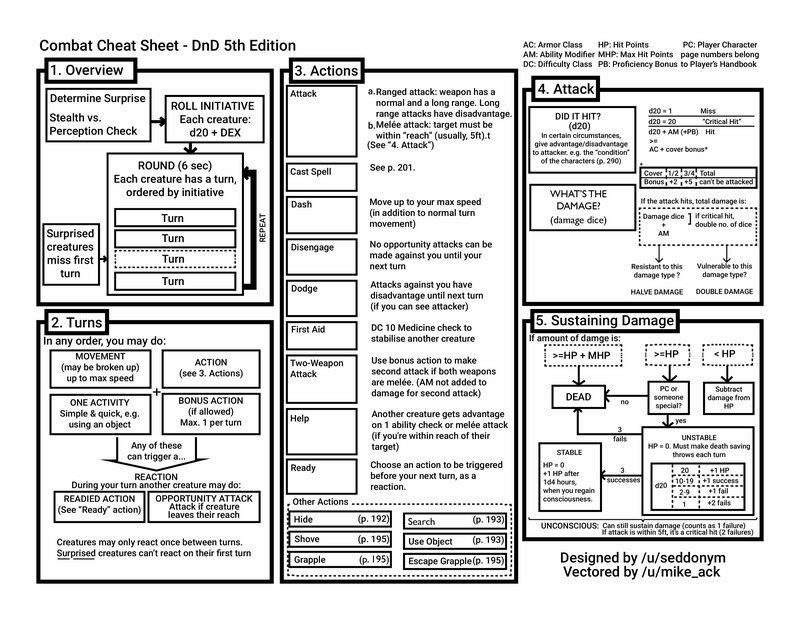 This is a Dungeons & Dragons 5th Edition Encounter Calculator. This is a good 5e Random Generator. It has traps, treasure, lots of different items, magic and downtime events. Redkat’s 5E D&D Tools also has a great set of random generators. This is a good 5th edition SRD (System Reference Document). I found a lot of excellent resources on this donjon site. I haven’t use this NPC Generator, but it looks like it could be useful. Here is another spell list. It is great at allowing you to sort this list in many different ways. Create your own document. This allows you to create beautiful documents that look very professional and very D&D like. It requires a steep learning curve, but the final results can be fantastic. For background music – here is an excellent playlist for Dungeons and Dragons provided by MightyBenj. Here is an encounter builder by the Kobold Fight Club. Here are some great DnD 5e Monster Cards by Almega-3 on DeviantArt. Speaking of Monster Cards. Not a pretty, but here you can customize and print out what you need. Here is a “create your own RPG cards” site. Need an interactive map of Faerun? I’ll finish this list with a reference page I found useful. All About Scales. PS In case you missed it, I have added a “Buy me a coffee” tab to the page links at the top of the screen. A thanks to seddonym over at reddit for his original post HERE, and to mikr_ack for putting it in this very useful format HERE. I am looking forward to running a “Tomb of Annihilation” campaign. One of the fun things in that book are the dinosaurs. I like to use miniatures on my battlemat and I thought an inexpensive way to do that was to get some small toy dinosaurs the right size, glue them to a base and paint them. I have some rubber toy dinosaurs and one or two of them may do, but I am finding that most of them are too large. Also I realized that I didn’t know what some of the different dinosaurs look like. Unlike most monsters in the Monster Manuel, it doesn’t have pictures of each different dinosaur type. As usual, Google is my friend. There is no shortage of information regarding dinosaurs. Here is a compilation of what I have found regarding the Dinosaurs in the Monster Manual (MM), Volo’s Guide to Monsters (VGtM) and Tomb of Annihilation (ToA). Playing on a grid where one inch = 5 feet, I want to mount the miniatures onto round bases. A one inch diameter base will just fit into a one inch square and is the size for a medium creature. This table shows the size of bases I need for my dinosaurs. Having just finished one campaign and preparing to start another one, I felt that it was time to review my weaknesses as a Dungeon Master. Thanks to an excellent post on “The Angry GM” site, and a candid review of my own DM style by Tim, a former player, I have compiled this list that I intend to re-read before and after each gaming session. 1) Pre-read enough to make the game day run smoothly. 2) Have figures set aside for upcoming encounters. 3) Have monster stats printed out for the inevitable encounter. Running a D&D game is a storytelling craft on top of die rolls, which makes the DM chair the most difficult but often most entertaining of the game. There’s two aspects of the game to manage, the character experience, and the player experience. All the players need their characters to have their moment to shine. Provide variety in how NPCs/monsters interact with PCs. The encounters need not always be a fight to the death. Always appeal to the players’ sense of sight, smell, touch, taste, and sound when narrating. Begin and end each players turn with narration. Each turn follows a simple process. After every transition you need a bit of scene setting. Even if it’s just a single sentence. In fact, that’s all it should be. At the start of every turn in combat, you should say a few words (and NO MORE) about what’s going on in the scene right now, specifically to the person whose turn it is. Even if all you do is remind the player of what just happened. The transitions out of one turn and into another meld together. The resolution of one action sets the scene for the next. As a GM, it’s your job to bring the combat to life. To make it feel like an emergency, like a life or death situation. At the start of every player’s turn, you need to point out where they are and what emergency is happening right now, either to them, or right near them. In a life-or-death battle, the proper feeling for a player is near-panic. Players should feel panicked and rushed in combat because the characters are panicked and rushed in combat. When it is a player’s turn, they need to begin speaking immediately. And if not, you need to prompt them. “What do you do? You need to decide or you’ll lose the turn to indecision.” Assume they take the Dodge action (attacks against him have disadvantage). Alice: I’ll run up and hit the goblin with my mace. 15. GM: The goblin leaps aside, dodging your axe. He tries to dart past you to close with Dave. You get an opportunity attack. Roll it. GM: The goblin dodges that too and dashes forward, lunging at Dave with his shortsword. Dave, what’s your AC? GM: Ouch. He stabs you in the side for 6 piercing damage, sending you stumbling backwards while the other two goblins draw to a stop and face Alice and Bob head on. Alice, the goblin recovers his breath from your blow and thrusts his shortsword. A crit! You take 12 damage. Alice: Damn it! I’m really hurt! GM: The other goblin closes with Bob as he’s trying to stop the one getting past him. But… Bob sees him coming and dodges the blow. That’s a miss. GM: The goblins range themselves in front of Alice and Bob while a third goblin is ready to strike another blow at Dave. Carol, they seem to be ignoring you. What do you? So What Can I see From Here? Usually, the limit to how far characters can see will be some obstruction, such as a building, a forest, or some hills. Mist and darkness also limit vision. Sometimes, however, the characters will be on flat plains on a clear day and the only limit to their vision will be their perception and the horizon. Once something goes below the horizon, it can’t be seen. But where is the horizon? This table has been simplified for gaming use. On an earth-sized planet, the horizon for a six-foot tall person standing at sea level or on flat plains will be about 3 miles. This means that they can see features that are at ground level for up to three miles (depending, of course, on the quality of their vision and the size of the object). Features that are higher than ground level can be seen further. To determine how far away you can see something, just add together all of the heights. For example, if a 6 foot man is on a 4 foot horse standing on a 30 foot hill, how close would you have to be to a 60 foot tall tower to see it? First add all the heights together 6 + 4 + 30 + 60 = 100 feet. Look at the table under “height in feet” and find 100 feet. Then look across under “miles away” to find 13 miles. So the tower could be spotted if it was no farther away than 13 miles. You could see a 14,000 foot mountain a little more than 100 miles away. This is good for seeing features on a map, such as lakes, forests, mountains, towns, etc. but knowing how far you can see is often not what your Player Characters need to know. Just because you can see 3 miles doesn’t mean that you can see a monster on the horizon. For that we need another table. Creature – Diminutive 6” – 1 ft. 30 ft. – 60 ft. 5 ft. – 10 ft. Creature – Tiny 1 ft. – 2 ft. 60 ft. – 120 ft. 10 ft. – 25 ft. Creature – Small 2 ft. – 4 ft. 120 ft. – 240 ft. 25 ft. – 50ft. Creature – Medium 4 ft. – 8 ft. 240 ft. – 480 ft. 50 ft. – 100 ft. Creature – Large 8 ft. – 16 ft. 480 ft. – 960 ft. 100 ft. – 200 ft. Creature – Huge 16 ft. – 32 ft. 960 ft. – 1,920 ft. 200 ft. – 400 ft. Creature – Gargantuan 32 ft. – 64 ft. 1,920 ft. – 3,840 ft. 400 ft. – 800 ft. In this table “perceive” means that you can see it and may notice it with a perception check. If you do notice it you will recognize the creature type if you have seen one before. If you don’t know what type of creature it is you will be able to tell the creature’s coloration, size, shape, number of limbs, wings, etc. If the creature is moving, you will also be able to tell which direction it is traveling and about how fast. “Identify” means that you can see details and may recognize an individual that you have met before. Distance away (in feet) that you can perceive an item is its size (in feet) times 60. Distance away (in feet) that you can identify an item is its size (in feet) times 12. Round fractions down to the nearest 5 ft. The item’s size is its longest dimension (height or width). You can perceive a burning candle 1 1/2 mile away.